Maud May Babcock was an author and speaker, and the first woman on the University of Utah faculty, where she founded the departments of speech and physical education; she remained on the faculty for over forty-five years. 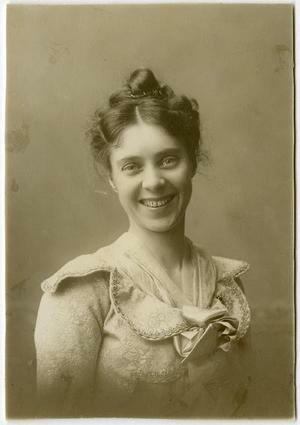 She originated the first college dramatic club in the United States and produced more than 300 plays and was known as the first lady of Utah drama. She was successful in bringing big-name talent to perform in Utah. She had a knack for leadership and served for two decades on the board of the Utah School for the Deaf and Blind, twelve of those years as president. She helped plan the building of the Deseret Gymnasium, was the first woman chaplain of the Utah Senate, and served for many years on the Young Ladies’ Mutual Improvement Association general board. Babcock was born on May 2, 1867, in East Worcester, New York. She earned degrees from Welles College in New York, the Philadelphia National School of Oratory, and the American Academy of Dramatic Art. She was studying and teaching at Harvard University when she met Susa Young Gates who convinced her to move to Salt Lake City where she joined The Church of Jesus Christ of Latter-day Saints. She loved doing genealogy and serving in the temple. Historian Laurel Thatcher Ulrich noted that Babcock had performed 21, 234 vicarious temple endowments by her own estimation. Babcock wrote five books on speech and elocution and mentored others, such as Lethe Tatge. She died on December 31, 1954. This page was last edited on 22 October 2015, at 23:11.